Are you looking to have Wi-Fi in your home, but you don’t have a router? This may sound strange, but it is possible using the mobile hotspot feature on your computer. 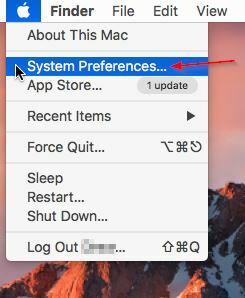 Many of the newer and more popular computer operating systems support this feature (for free). This method of sharing an internet connection is frequently referred to as ‘mobile hotspot’, however this setup differs from most people’s definition of mobile hotspot – which is the process of enabling a feature on their smartphone so that they can tether a computer to the phone for internet access through the phone’s mobile data connection. Using a smartphone’s hotspot permanently will get expensive very quickly – since you will likely blow through your mobile data allotment in short order. This type of hotspot also requires that the phone has adequate mobile data reception – if your signal is too weak, you won’t be able to even turn on the mobile hotspot functionality on your phone. The solution we are discussing here uses a computer to act as a router in order to share an internet connection. The internet connection you are sharing could be a Cable or DSL service of your own, or perhaps a neighbor’s Wi-Fi that they are granting you access to. There are multiple reasons why someone would want to go without a router. The most common reason is that someone has recently moved and doesn’t yet have a router because they either didn’t buy one yet or because their old router is packed away somewhere and they can’t find it. Or, perhaps they were leasing their last router from their ISP – in this case, they would have had to return it when they disconnected service at their last house/apartment. Also, people that are traveling frequently can benefit from hotspot functionality on their laptop. Frequently, while traveling, you will run into internet access services that only allow one device online at a time. Want to get online with both your laptop and your tablet? In this case, you may have to pay again to get the second device online as well. This type of service is not uncommon and is typically found in airports, cruise ships, and some hotels. A Mobile hotspot on your computer can alleviate the need for these additional charges and allow you to only pay one access fee for all of your devices. There’s no reason why you couldn’t rely on this set up permanently, however, most people will only use it temporarily – such as when they are on travel or if they just moved in to a new place. A router isn’t THAT expensive and the benefits of using a traditional setup versus a mobile hotspot are many. If you are wishing to share your own Cable/DSL service, your computer will also need to have a wired network adapter for connection to your Cable/DSL modem. If you are sharing a nearby Wi-Fi network, a wired adapter is unnecessary. 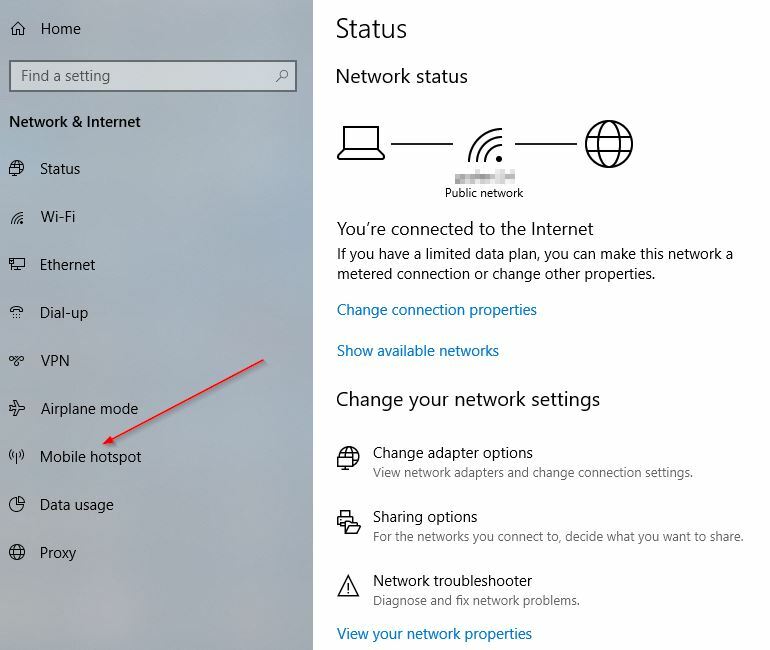 See the mobile hotspot procedure for Windows 10 below, or jump ahead to the instructions for MacOS. You will see a drop down box that says ‘Share my Internet connection from’. If you have multiple connections to the internet, such as a Wi-Fi connection to someone else’s network plus a wired connection to your Cable/DSL modem, you will see them listed here. Choose the connection that you want to share. If desired, you can change the network name and password by clicking the ‘Edit’ button. Your password needs to be at least eight characters long. Alternatively, you can keep the randomly generated name and password that is already shown on the settings screen. Lastly, move the slider at the top of the screen that says ‘Share my Internet connection with other devices’ to ‘On’. Your computer is now acting as a router. 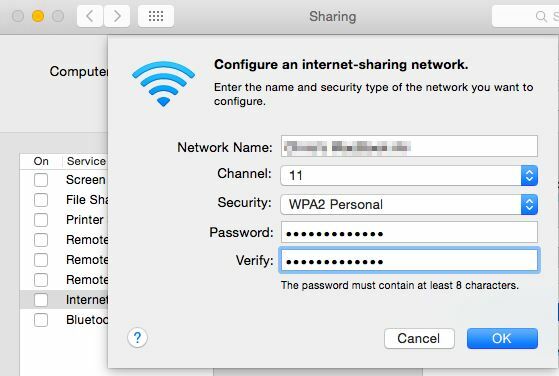 You should now see your shared wireless network available on other devices in your home and you should be able to connect to that network using the password shown on the mobile hotspot configuration screen. Remember: If you turn off or reboot your computer, you will cut off anyone else that is using your hotspot. 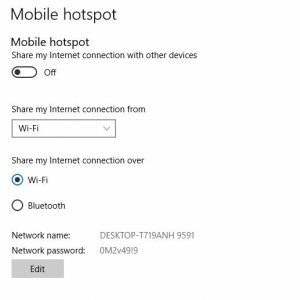 Note: With MacOS, you can create a mobile hotspot just like in Windows 10, except you can typically only share a wired Ethernet connection. 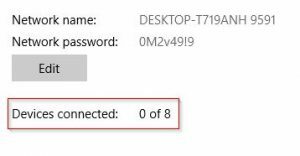 This is due to the fact that Windows 10 allows you to connect to a Wi-Fi network and then share that same network on the same wireless adapter. 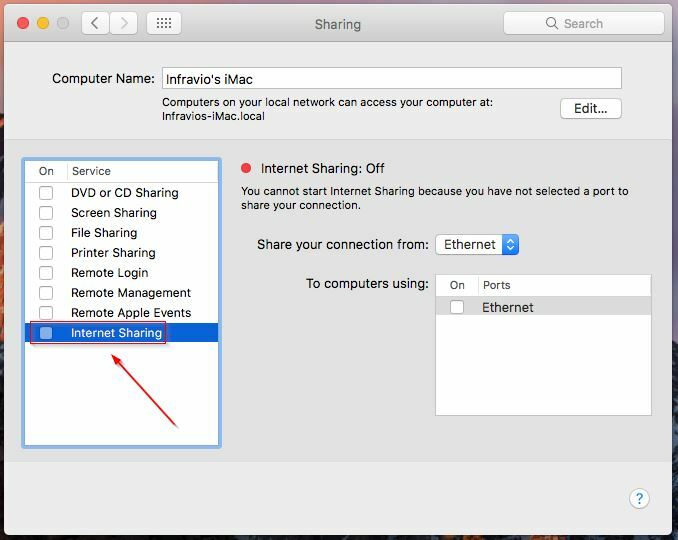 MacOS does not support this functionality, so you are generally limited to sharing an internet connection that comes in through the computer’s wired Ethernet port, unless you happen to have two wireless adapters. 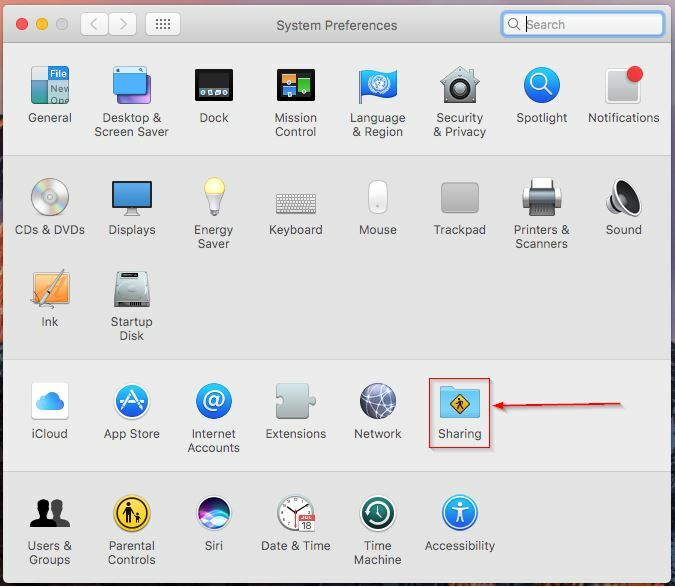 However, many people want to share their Cable/DSL service through their computer, so this functionality on the Mac is still definitely worth mentioning. We recommend selecting ‘WPA2 Personal’ from the ‘Security’ box and then pick a secure password. If you don’t set a security mode, the network will be created as an open network, which will allow anyone to connect to it. Bad idea. Lastly, check the checkbox next to ‘Internet Sharing’ on the left to enable the hotspot. ‘Internet Sharing’ will show as ‘ON’ and have a green dot next to it once it has successfully been enabled. You should now be able to see the Wi-Fi network on other devices and connect to it to access the internet. Andrew Namder is an experienced Network Engineer with 20+ years of experience in IT. He loves technology in general, but is truly passionate about computer networking and sharing his knowledge with others. He is a Cisco Certified Network Professional (CCNP) and is working towards achieving the coveted CCIE certification. He can be reached at andrew@infravio.com.